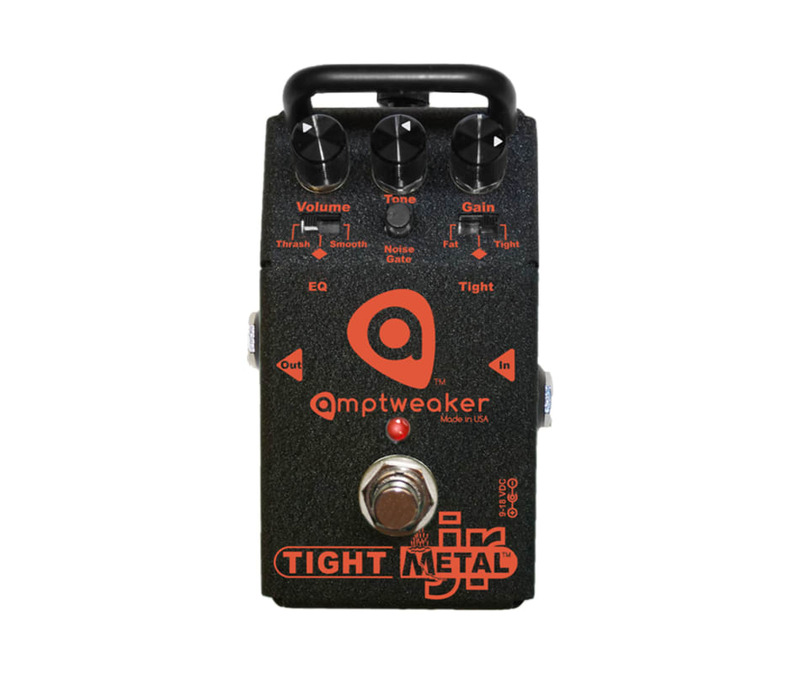 With ever-shrinking pedalboard real estate, a common request to Amptweaker has been for smaller footprint versions of our popular distortion pedals.....introducing the Amptweaker Jr Distortion Series. These pedals share most of the tone-tweaking features available on their larger counterparts, while eliminating effects loops, lit controls, battery switches and boost features that some players dont need in order to shrink down the size and weight. Derived from our Pro series, the Tight control and Fat switches were re-configured into a 3-position Fat/Normal/Tight switch to dial in the attack of the notes from thick and heavy to aggressive and chunky. An EQ switch similarly provides Plexi(Thrash on TightMetal JR)/Normal/Smooth tone settings, which helps the pedals cover much of the range of both their Fat and Tight parents. In addition to Gain, Tone and Volume knobs, theres also a manually-adjustable Noise Gate which can be cranked to stop notes hard and fast. And the great thing about a built-in noise gate is that it goes away when you turn the pedal off.....so your clean tone is unaffected! Runs on 9V to 18V batteries or supplies - 9V sounds heavier, more compressed, while 18V is more open and less distorted.